The pack meeting scheduled for 4/8/19 is cancelled due to the threat of severe weather. The deadline to turn in day camp forms is 4/8/19. Forms will be collected on 4/8/19 at the Legacy Park Clubhouse between 6pm an 7:30pm. 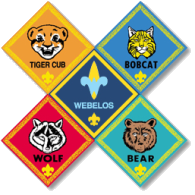 All scouts that are attending day camp need to turn in a health form and registration form. All adults attending must turn in the registration form, health form, and training certificates for Youth Protection 2.0 and Weather Hazards. Training can be completed at My.Scouting. Information for camp and registration can be found here.